The east coast of the US is largely formed by barrier islands. This is a thin strip of sand along the low-laying coastal land. In the north of New Jersey, this sandy strip collides with the mainland, known as the Northern Headlands. Where this strip of dunes is located, has a lot of consequences for the flood risk. 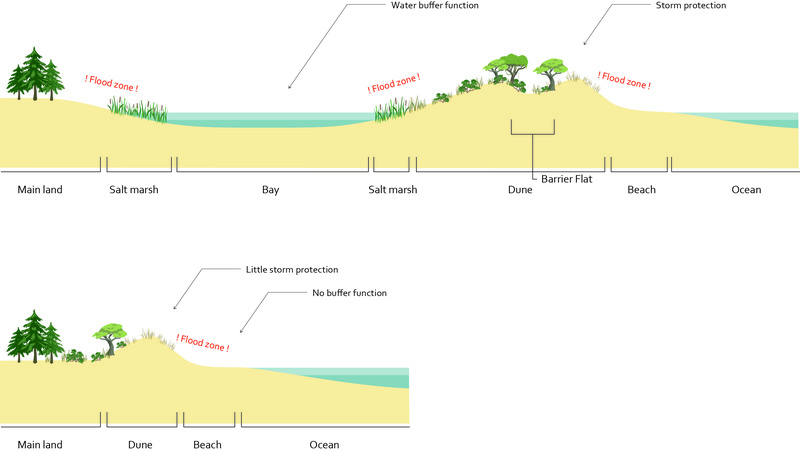 The presence of a barrier island creates a first line of defense against storms and floods. The bay behind it, naturally functions as a buffer for large amounts of water. At the Northern Headlands, there is only a small strip of dunes directly in front of the mainland and coastal lakes form the landscape. People are naturally drawn to water. So, in many places along the Shore, people build their homes close to the ocean of bay. Unfortunately, these edges are exactly the place where flood risks are present. The privatization of the coastline makes flood protection measures hard to implement. 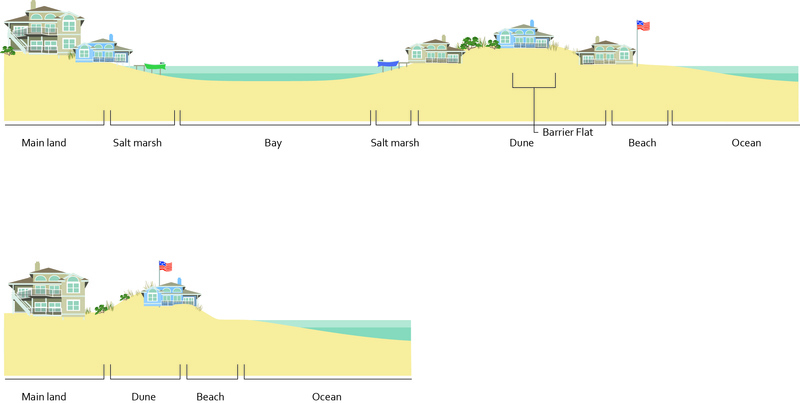 A lot of ocean front plots, that would be interesting to develop flood safety measures in, are privately owned. State and county level efforts cannot plan their measures in those areas without consent of the property owners. In the 10km around Asbury Park, more than 50% of the shore surface is not in the hands of the government. Other borders that fragment the shoreline are town lines. Around the Northern Headlands, there are already 31 local governments present just on the ocean front of the Northern Headlands! In the Netherlands, we accept interferences from high level governments. The American people think differently. The American Dream, individual freedom and your own responsibility for success are very important. Governmental decisions are therefore taken on the lowest possible level of government, to ensure that any change is close to the needs and desires of individual people. This is called Home Rule. A result of this attitude is that regional plans or strategies are hard to implement. Towns built steels walls for example, that stop at the border of another township. Or a small city constructs a breakwater to encourage natural sedimentation on its shore, but the next village has to deal with the backlash behind the structure. In the recovery process, FEMA was responsible for dividing the 65 billion dollar of federal money over the states, towns, organizations and people that were hit. Unfortunately, FEMA regulations prescribed that money would only go to plans that focused on rebuilding back what was there before the storm. So towns whose boardwalks were hit, could only apply for FEMA money if they would rebuild them back as they were before, not for an elevation or dune expansion. Money-wise, communities’ only option was to build back what was there before, even though this situation has proven itself to have bad flood protective qualities. For home owners, FEMA money could be provided to raise homes. To do this, they had to update the flood risk maps of the entire area. These maps state the zone that is in flood risk and prescribe which homes are obligated to raise their homes. Due to conservative politics, FEMA was not allowed to base these maps on sea level predictions and expected climate change. The flood maps were therefore outdated on the day of their publication. All these factors together, and more that are in the full report, form a complex web of reasons why there are little long-term flood protective strategies in this area: The shore is fragmented through town borders and private property. Conservative politics form the way that the rebuilding process was done. All these reasons keep the current way of thinking in place while the flood risks keep growing, the shores are being urbanized even more and after a storm only short-term fixes take place.